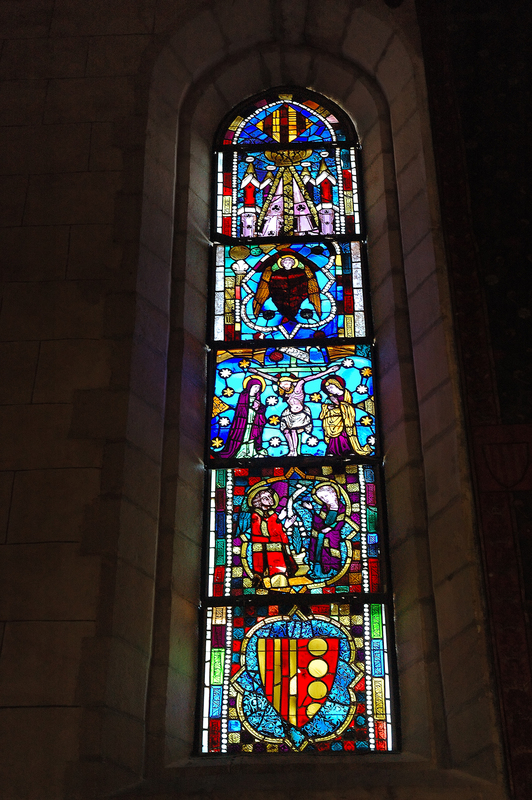 While in Pedralbes Monastery I noticed this beautiful stained glass window. Everytime I see these religious figures pierced by the incoming light I wonder what effect would the colors and scenes have upon the extremely faithful and fearful medieval souls. Then I can't help thinking on how many people have prayed gazing towards the infinite nothingness asking for divine favors through these stained glass panes. All those years of solitude and whispering slowly come and soothe my soul like a monotonous litany. I am not a religious man and I can't really explain what it is. Maybe is just because my father took me to churches just for the sake of art, literally, or so he said. This art with a purpose, the Gothic purpose of impressing parishioners always works, even for me. Wow, beautiful colours. Very nice image. These stained glass windows are always one of the incredible parts of religious architecture. The rose windows are particularly stunning. Yes, that's a great shot, you've captured it beautifully. I am so happy you posted these photos! We went past the monastery on the Bus Turistic but didn't get off because we wanted to get back for the Castellars. It's on my list of things to see next year. I love beautiful stained glass. . . I was going to comment on art in churches, but. . . .
Great shot! I dont see much stained glass from where I come from, but recent preparations for a glass art article have been very mindblowing. Like knowing Lino Tagliapietra's art and that of Dale Chihuly, for instance, thru the web. Please visit http://www.squidoo.com/art_glass for more details. Thanks my friends. Welcome Rael. I see that your site has to do with my post so I will make this one exception for you.